Troye has now released the official music video for 'Bloom' which you can watch below! 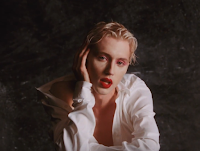 He's spent the last few days teasing a new single on social media, and now Troye Sivan has dropped the fantastic 'Bloom' from his forthcoming album. The song follows in the foosteps of previous release 'My My My' and 'Good Side' and doesn't disappoint in the slightest. We'll have more in depth thoughts on 'Bloom' in New Music Friday coming tomorrow, but for now you can press play below and let us know your thoughts!